No doubt you’ve heard of Rothy’s, the eco friendly casual shoes made from recycled water bottles. 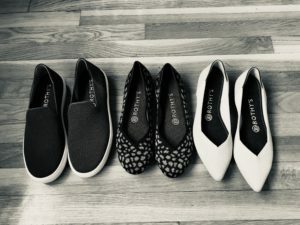 These shoes have quite the cult following especially with savvy shoppers who like the newest and coolest stuff (aka Peloton riders). In real life people seem to love them or hate them and after a lot of trial and error I think I can tell you why. It’s all in the fit! The fabric used has just a tiny bit of stretch so if they are exactly the right size they feel great, but if you are in between sizes they can be uncomfortable. If you are lucky enough to have a Cinderella moment and for them to fit you perfectly right out of the box you probably drank the kool aid right away. If you are like me and so many others you may have fallen into a weird limbo where you can’t decide if they are too small and will hurt your feet after a long day, or if they are comfortable but maybe too big. The answer for me has been trying a lot of styles and sizes and customizing the fit. Yes for $100+ is fairly annoying that you have to do additional work to make them perfect but for me it has been worth it. If you have the slightest suspicion you might need to size up or down, order multiple sizes, even of the same color. Certain colors can sell out quickly and are not always restocked. Rothy’s offers free returns (more on that later) and their exchange process can be tricky. Each style fits a little differently and sizing varies as well. In my option from smallest to largest I would say they are Point, Loafer, Flat, Sneaker. I went up half a size in the Point and Loafer and stayed with my regular size in the Flat and Sneaker, the Flat being a little snug. Try them all and see what works for you. Try swapping out the Rothy’s insole with a slimmer one. The Odor Eaters Soft and Slim work great (regardless if your feet smell or not) and will give you that extra .25 of a size wiggle room. Try a thicker insole or no-show sock. Sheecs work perfectly with Rothy’s and they don’t fall down, really. They are also great if you need a little extra insulation in the fall or winter. Use the code MSFW18 to save 20% off your purchase. They are machine washable but do NOT put them in the dryer! They will shrink! You have 30 days to return your unworn Rothy’s. That means make sure you try them on for a bit indoors to make sure they are the right size and don’t delay on making a decision. If you mail them back to Rothy’s your credit can take some time be issued, but luckily they now are part of Happy Returns. It’s a super easy option to make returns at local “return bars” usually within stores not associated with Rothy’s. No printing a label or waiting in line at the post office, and your credit will be issued almost immediately. If for some reason none of these options work out for you, Rothy’s have a really great resale value. Check facebook groups or poshmark and you’ll likely recoup most of your cost. Ready to take try them? Click here to save $20 off your first pair. Have you tried Rothy’s already? What’s your favorite style?